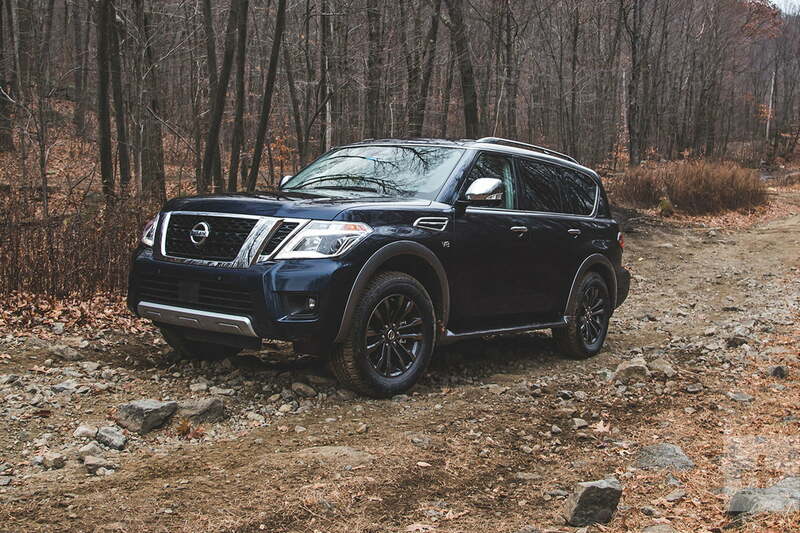 The 2018 Nissan Armada is well equipped, tough – and a bit dated. Despite what you’ve read in the news about the war against fuel inefficient vehicles, people can’t stop buying massive, gas guzzling SUVs. I was reminded of that when I took delivery of the 2018 Nissan Armada, a full-size SUV many thought would’ve disappeared by now. 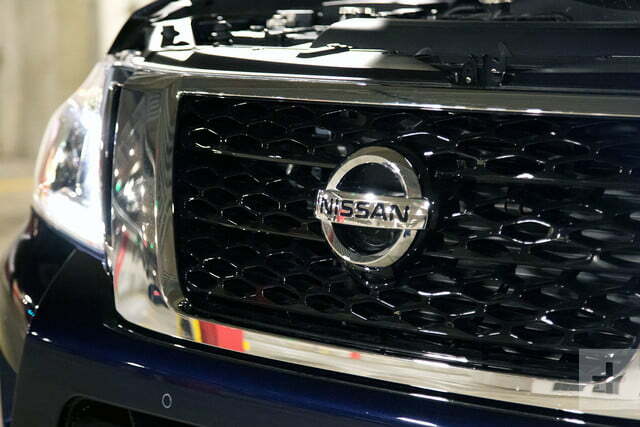 In fact, Nissan’s current body-on-frame offering is still alive and well, following a complete makeover in 2016. 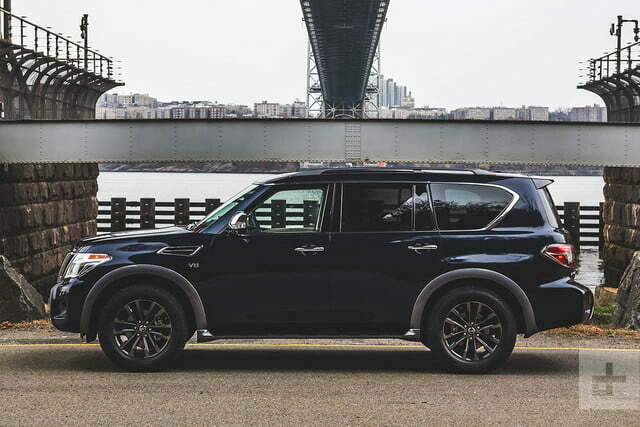 Built on the latest version of Nissan’s truck and SUV “F-Alpha” platform, the Armada shares its backbone with the former Infiniti QX56, and latest QX80 luxury SUV. The 2018 Nissan Armada is available in a total of four- trims, with the base model “S” starting at $46,090. Bumping up to the “SL” raises the price to $50,850, ticking off improvements like 20-inch wheels over the base 18-inch rollers, and a 360-degree camera. Taking a massive leap to $59,190 is our tester’s “Platinum” trim. Checking all the boxes is the top-spec “Platinum Reserve” trim, which is just short of making the jump to an Infiniti QX80. While it looks good on paper, the Nissan Armada battles full-size SUVs from two of America’s “Big Three,” General Motors and Ford. These include the Chevrolet Tahoe and Suburban along with their GMC cousins and the all-new Ford Expedition. Another strong competitor hailing from Japan is the Toyota Land Cruiser. It’s a tough crowd of competitors. Can the gigantic Armada force its way ahead of them? 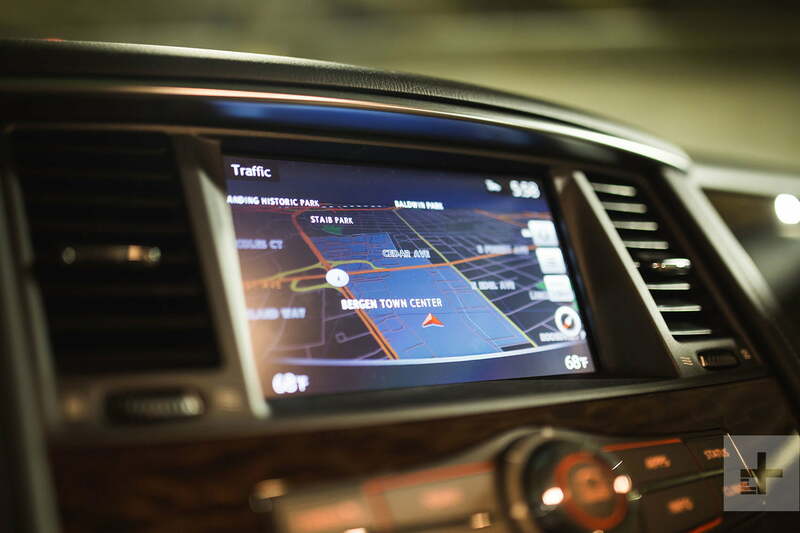 Our tester’s list of standard features includes NissanConnect infotainment with sat-nav and a Bose sound system. 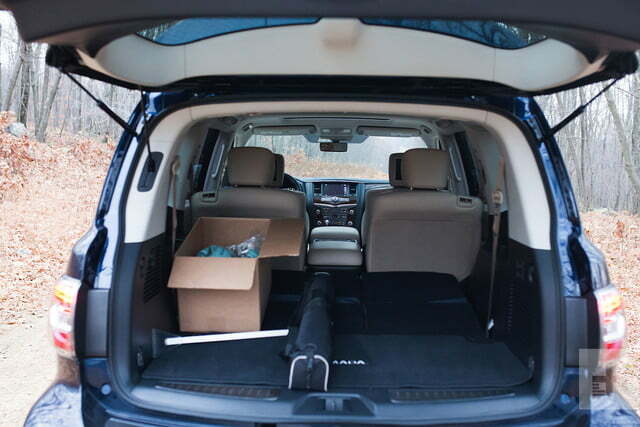 The standard safety kit is as substantial as the Armada itself and includes Automatic Emergency Braking, Blind-Spot Warning, forward-collision-sensing automatic braking, and automatic braking reverse assist. On the convenience front, radar-guided cruise control and a power one-touch moonroof come standard. As you’d expect, interior space is cavernous enough that one could almost live out of its 171.1 cubic-feet of total interior volume. But if making a mobile home isn’t your mission, the Armada seats up to seven people, plus all their things. Our sampler came with the optional $450 “captain’s chair” arrangement for the second row, swapping the bench out for individual bucket seats. It’s all very comfortable and yet, it all feels strangely outdated. We blame that on the upright dashboard, hard-to-reach controls, and switch gear that’s obviously from Nissan’s previous generation. The quality of the materials is about on par with its competitors, if not a tad on the plasticky side. And despite the suite of technology, up-to-date connectivity, and features, the Armada’s 8.0-inch infotainment screen still feels like its stuck in 2010 with a low-resolution look and blocky menu design. Given that the latest Armada, and its Infiniti cousin, are based on a platform that came out eight years ago, this isn’t the least bit shocking. 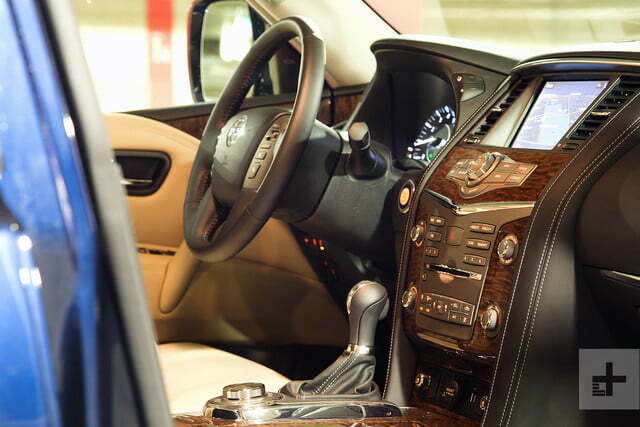 One will find a far more modern interior in any of the American alternatives. As you’d expect from something that resembles a huge chest freezer on wheels, the Armada’s on-road mannerisms are ponderous. Its dimensions are slightly larger than a competing Chevrolet Tahoe, at over 17 feet long, 6.6 feet wide, 6.3 feet tall, and 5,822 pounds of curb weight. Handling isn’t its strong suit. Any attempt at spirited driving causes the Armada to scream “what the heck are you doing! ?” before it flops into submission. The ride seems stiff at first, but it does absorb road imperfections, allowing few big bumps into the cabin. While an adaptive suspension is standard, it’s designed to handle load-leveling when towing heavy trailers, not to enable an aggressive sport mode. As you’d expect with something resembling a huge chest freezer on wheels, the Armada’s on-road mannerisms are ponderous. 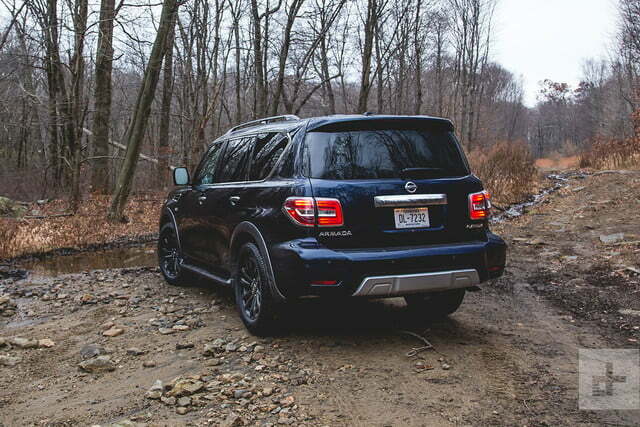 Even normal driving makes the Armada’s heft obvious. It often feels slow, dull, and brutish. It takes some getting used to but, once you do, it becomes a quiet and comfortable long-distance cruiser. 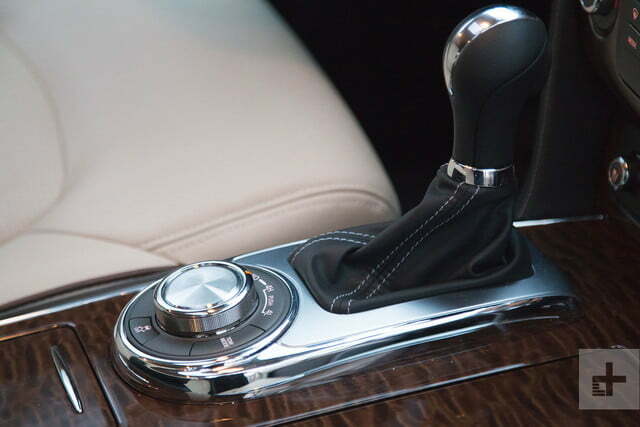 Nissan’s latest “Endurance” 5.6-liter DOHC 32-valve V8, with 390 horsepower and 394 pound-feet of torque mated to a seven-speed automatic, motivates this leviathan. The result is that 0-60 only takes around six seconds to complete from a standstill. And it sounds great doing so. Top speed? Irrelevant, but if you had to ask, it’s limited to 133 mph. That power isn’t supplied as much for performance as it is grunt and hauling capability. 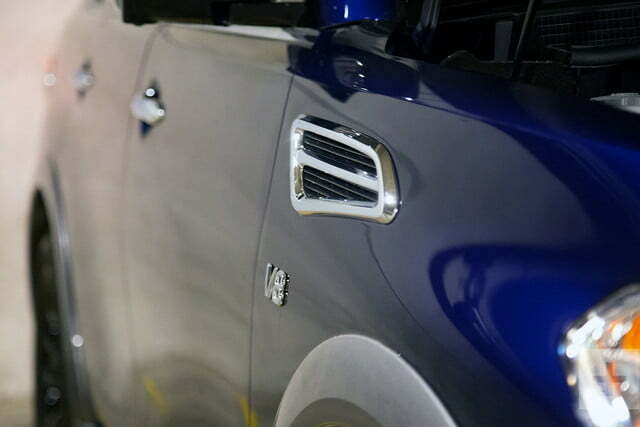 Right off the assembly line, all Armadas come with a max tow-rating of 8,500 pounds. That bests the Chevrolet Tahoe and Suburban by more than a ton (2,000 pounds), depending on how modestly it’s optioned. To come anywhere near that with the GM crowd, one would have to opt for a more expensive GMC Yukon with its optional tow package. And that even maxes out at 8,400 pounds, 100 short of the Armada. However, the Armada does lose to the new 2018 Ford Expedition, with its tow rating of 9,200 pounds. Unfortunately, we didn’t have anything to tow with the Armada. But there is one more driving trick the beast has up its sleeve. It can off-road, for real. The Armada is essentially an Americanized version of its global full-size SUV, the Patrol, a truck perceived around the world as Nissan’s answer to Toyota’s legendary Land Cruiser. 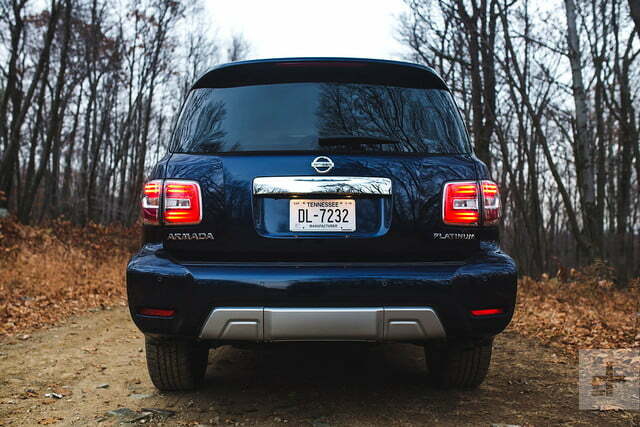 The US-bound Armada sadly does without all the Patrol’s fancy four-wheel drive gear. But that’s because American buyers aren’t likely to use the Armada the way it’s intended in desolate areas with difficult non-paved roads. 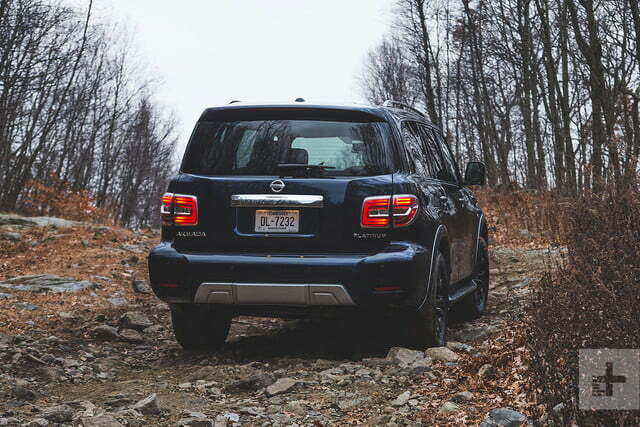 Still, we managed to find some rocky and muddy trails to explore in New Jersey, and the Armada proved itself very capable where most crossovers would simply run for the suburbs. As for fuel economy — “What fuel economy?” says the Armada. Like performance, fuel economy isn’t a priority. 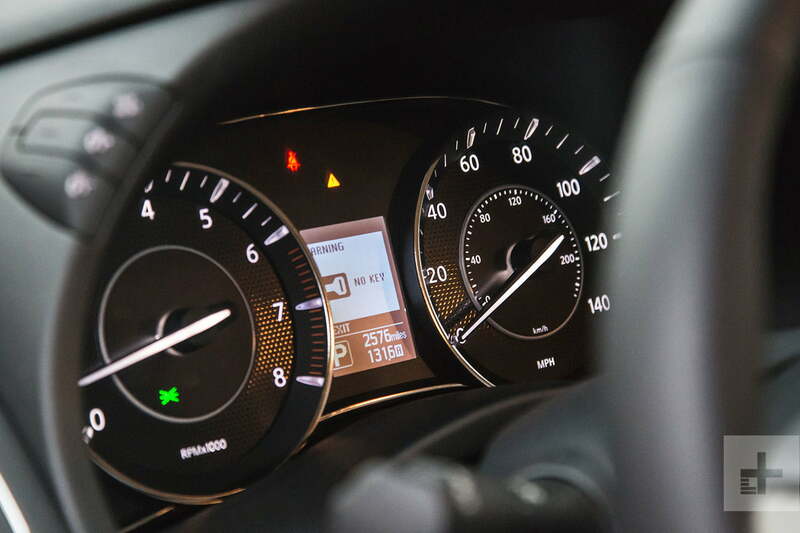 At up to 14 mpg city and 19 highway, funneled from its gigantic 26-gallon tank, the Armada isn’t light on fuel consumption. Even when compared to its competitors, an equivalent Chevrolet Tahoe manages up to 16 mpg city and 23 highway, thanks to cylinder deactivation. On the Armada, unfortunately, there’s no such clever trickery. All 2018 Nissan Armada’s come with a three year, 36,000-mile basic warranty, and a five year, 60,000-mile powertrain warranty, whichever comes first. 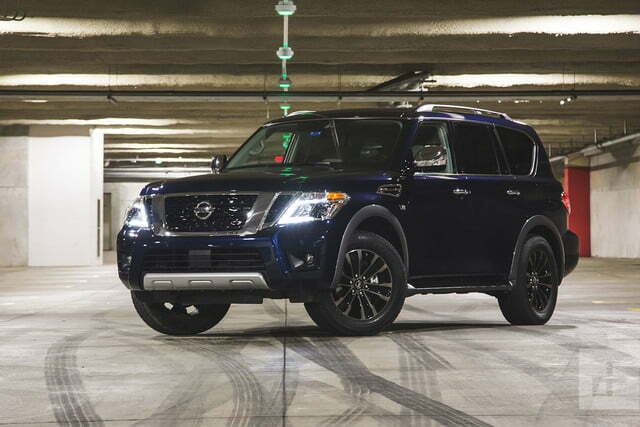 Because our actual 2018 Nissan Armada tester came very well equipped as the second-most expensive Platinum model, it’s the one we’d jump for, even with its Hermosa Blue exterior and Almond Leather interior. The Hermosa Blue is the only shade available, but it’s still the closest thing to matching Digital Trends’ blue. The Almond Leather helps lighten up the cavernous interior, unlike darker options, which makes it feel like a never-ending void. 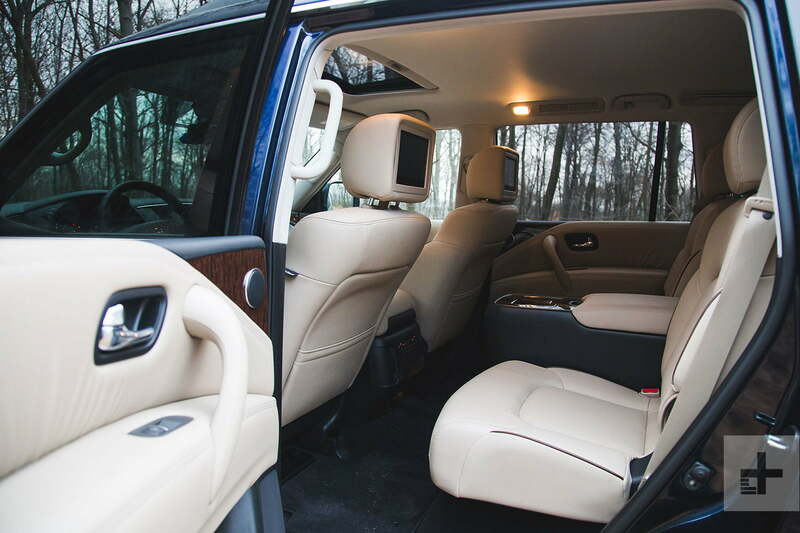 We can do without the $3,000 Platinum Reserve package, which brings some minor interior and exterior luxury appointments. At that point, a much nicer 2018 Infiniti QX80 becomes within reach, price wise. And it’s essentially the same truck, just dressed up to match Infiniti luxury brand. The near-loaded Armada Platinum guarantees every occupant is happy and comfortable with three-zone automatic climate control, heated and cool front seats, and a whole suite of safety technology. This includes a 360-surround camera, parking sensors, blind-spot detection, an intelligent rear-view mirror, radar-guided cruise control, automatic emergency braking, back-up intervention assist, and more. Oh, did we mention a rear entertainment system also comes standard? 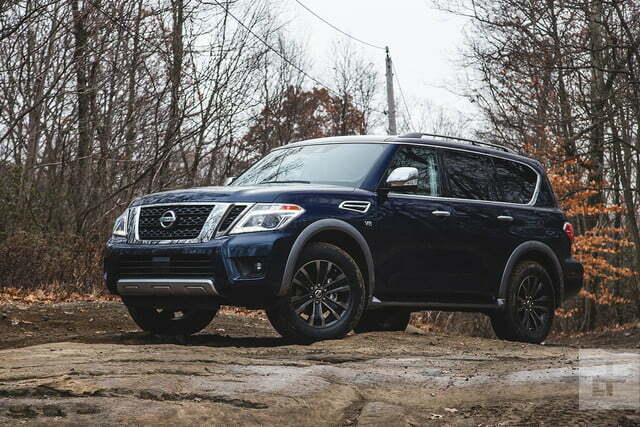 The 2018 Nissan Armada Platinum is a rugged full-size SUV geared more towards utility with its max tow rating of 8,500 pounds. 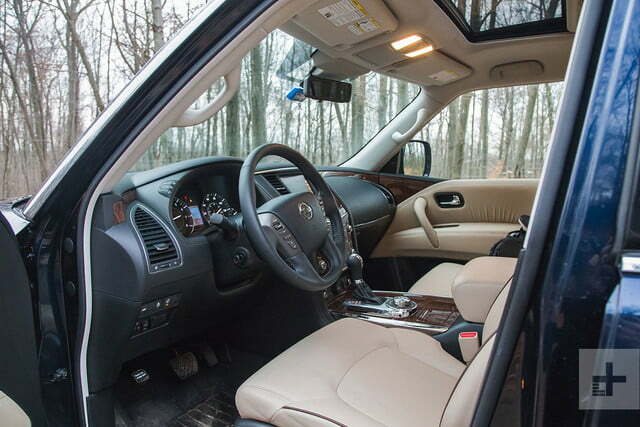 It also happens to be spacious, well-equipped, and comfortable. However, it’s not at all fuel efficient, and a bit clumsy to drive if you’re not used to driving large vehicles. Because it’s still based off of an SUV platform that’s almost a decade old, its age is starting to show itself with its handling, the seemingly dated infotainment screen interface, and the interior’s overall design. 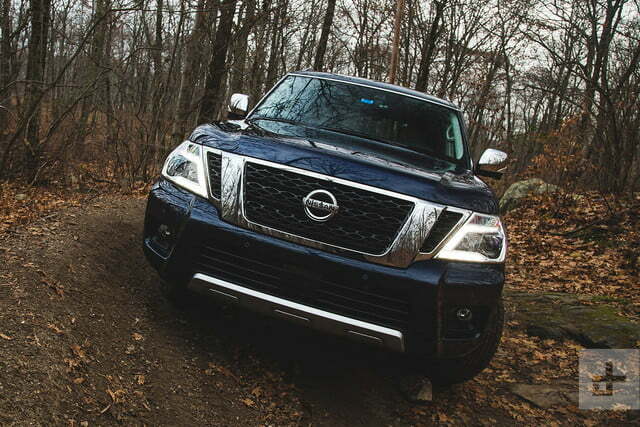 The Nissan Armada shares its playing field with the Chevrolet Tahoe and Suburban, its GMC cousins, the Yukon and Yukon XL, and the recently renewed Ford Expedition and Lincoln Navigator. 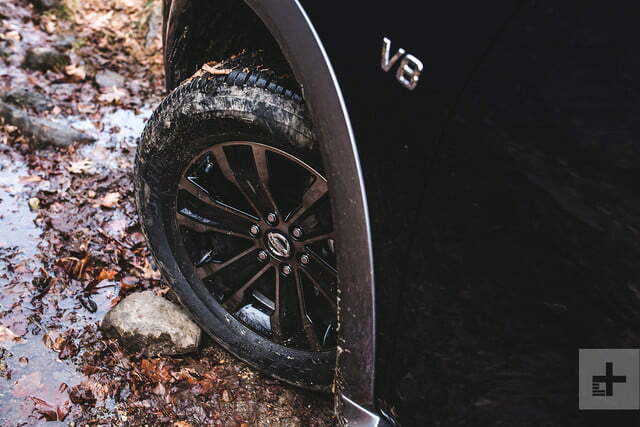 While the Armada does its just job perfectly fine, the GM offerings feel more up-to-date and are much better and easier to drive, while the new Ford Expedition and Lincoln Navigator also promise improved driving experiences, as they were recently redesigned from the ground up. No, unless the tow rating is a must-have feature, or you’re a diehard Nissan fan. The Nissan seems to trail behind the latest and greatest from America’s stablemates. 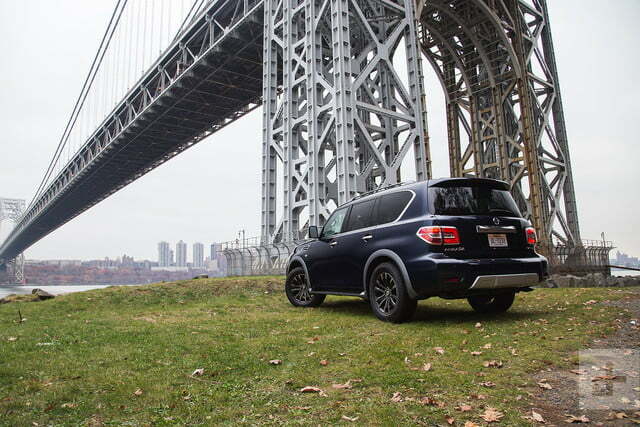 The Armada does a fine job at being a full-size SUV, but it only excels at towing and hauling in luxury. If you need that, it’s great – but most people don’t. If you don’t have a boat to put behind your SUV, you’ll be better off with a recently updated option from Nissan’s competitors.